This movie was out of our comfort zone and for the most part out of our understanding zone. 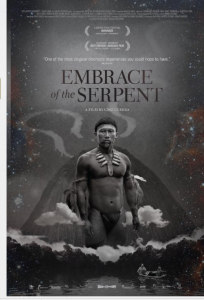 The purpose of this 2 hours and five minute film was to provide insight into the thinking of native people living in the Amazon region at the turn of the 20th Century, which probably reflected much of the way things have been for hundreds of years in the past. We also understand that there are still isolated groups of people living in this area today who think, speak, and believe in the metaphoric mysticism, which was conveyed in this film. We did meet the filmmakers, director, and screenwriter, Ciro Guerra and his wife who was a producer of the film, Cristina Gallego. On the basis of seeing this film and hearing them speak, we appreciate that they are obviously very knowledgeable and thoughtful about film making and about the people and culture they are depicting in this movie. We should add that they shared with us that in order to protect the film crew and actors that they brought into the Amazon, they obtained standard film insurance but also hired a Shaman to provide protection for everyone. The movie is based on the true story of two European explorers who travelled decades apart down the Amazon River, which is bordered by the territory the size of the United States, which includes parts of several South American countries. In this fictionalized account, each of them was shown to have the same native guide. The details of the story are not as important as it is to appreciate the way of thinking of the natives which are spiritual, mystical, close to nature, and rooted in the characteristics of the jungle. It was also a clear statement about the damage that the white man has done to their culture in the quest to exploit the trees that produce rubber, as well as in the attempt to convert the indigenous people to Christianity.